During the 31 Days of Walking Foot Quilting I promised I would take some pictures to show you what the binding will look like on the back of the quilt. For the most part my binding looks like the photo above. The stitching line is either right next, or right on top of the binding. Getting results like this is a matter of how far you pull the binding to the front of your quilt as described in part 1 and part 2 of the binding tutorial. 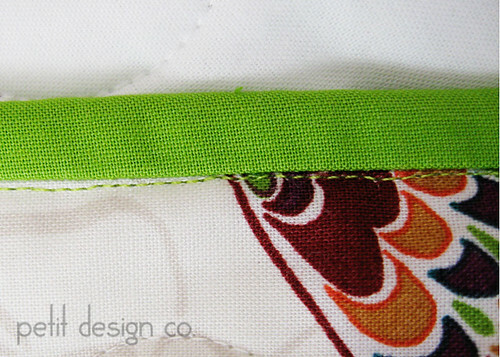 I pull the binding to the front just enough to barely cover the stitching line you will see on the front of the quilt. The more you practice the better you will get! This is really not as bad as it seems (this is a macro shot on my camera.) The distance from the binding to the thread is less than 1/16” Trust me, you hardly even notice it. Well you notice it but it doesn’t stand out and scream at you. That’s why the thread choice is important. Sometimes a use a contrasting color, and sometimes I use a color that matches the binding. I often bind with a walking foot too and I can live with that line on the back of the quilt. 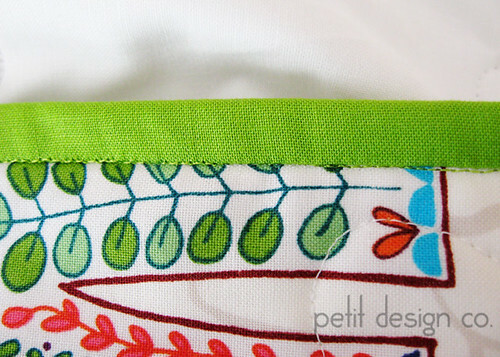 I use machine binding for heavy use quilts like baby quilts or ones for teenagers. thanks for showing us the many uses of a walking foot. Thanks for the post and for all your awesome walking foot posts!